Last night, we went to dinner to celebrate Duncan's proposal being turned in. 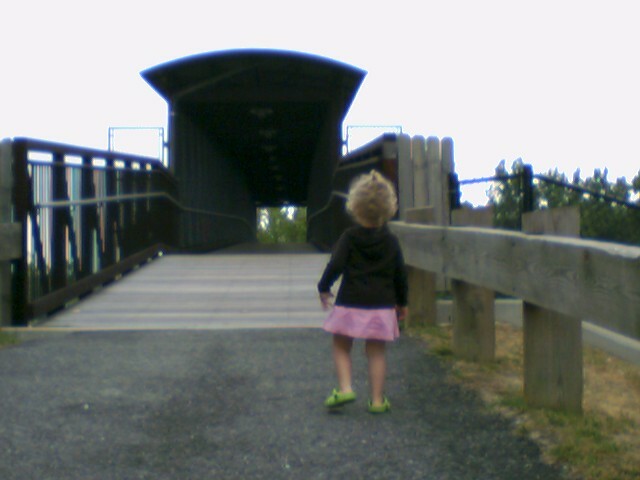 We went to a restaurant near a pedestrian bridge that Amelie often asks about as we drive under it. 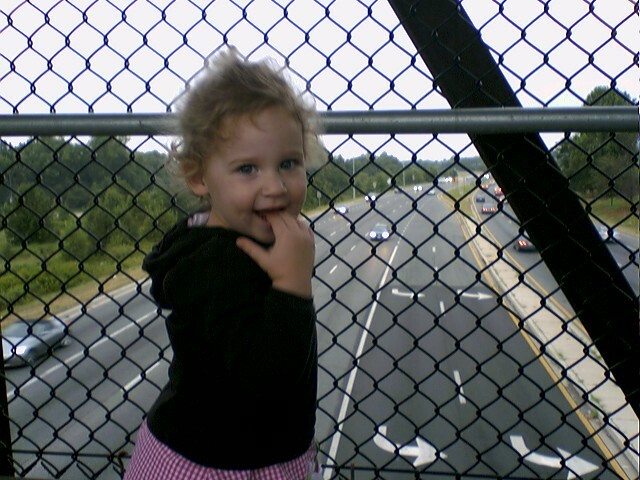 As a "treat" after dinner, we took a walk...literally across the bridge and back over it to our car. You would have thought we'd taken the kid to Disney World. 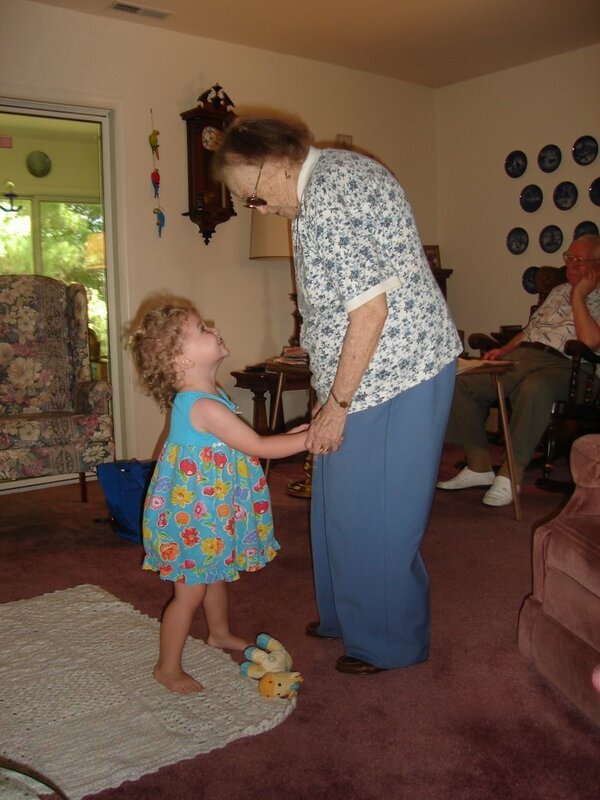 It was delightful to see her so excited about something so simple that we often take for granted. After all, it is a bridge, that goes over cars, that you can WALK on. How cool is that? * Today is August 28th. That means I added another $30 to my Starbucks card this evening. I only went over a little bit last month =). * Duncan's proposal is due on Wednesday at noon. Only two more days until we get Daddy back!! 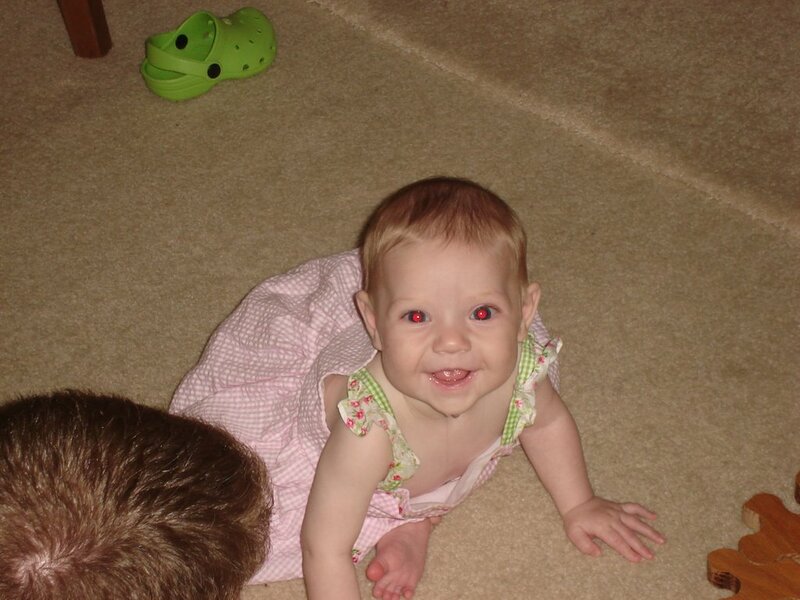 * Violet is practically crawling. Since Amelie didn't move much until she was 9 or 10 months old, this is "early." Everyone I mention it to says it's normal. * I added pictures to our family web page (linked at right). If I know you and you don't know the username and password, e-mail me and I'll give them to you. * I'm reading another book by Jodi Picoult...the third in a row. I'm going to blog more about her books later. * I bought Duncan the most recent Nickel Creek cd. It rocks the house. * I'm not teaching Spanish this year and I'm really ok with that. * I am amazed at my children every day. I am so thankful that I get to stay home with them. We're getting new neighbors! William and his parents are set to move in next door sometime around September 29th. His baby sister is scheduled to arrive, via c-section, about 2 weeks after that. Our former neighbors, the Duncans (yes that's really their last name), moved out in early June. We've missed them a lot and have been wwwwwwwwaaaaaaaaaaiiiiiiiitttttttting as patiently as possible for William to sell his house so he could move in next door. William's family goes to our church and he was born about 2 weeks after Amelie. Needless to say, we are very excited to have such good friends move in right next door. Our other neighbors are making motions like they may move in the near future, as well. Anybody interested? Yesterday morning, while on the phone with my mom, I heard a loud "thud." I asked Amelie what it was and she was clueless. When I looked into the kitchen, I noticed a feathery "splat" on the sliding glass door and gingerly moved my eyes down toward the patio to see if my thinking was correct. There, on its side, was what I hoped was just a stunned mourning dove. Its tail feathers were moving a tad and its eyes were open. My mom assured me it was probably fine and would fly away within an hour or two. I hoped that was so and checked up on it several times over the next few hours. The only thing that changed was that its eyes closed and it stopped moving at all. I didn't have much hope. Amelie noticed it when she got into her chair for lunch. Pleasant, I know. Her initial question was: "What's that big thing?" I realized that she had absolutely no frame of reference to be scared or sad or grossed out. Yet she knew something was not right with the situation. Birds don't usually lay down on our patio. After the simplest definition of death I could come up with, she repeatedly asked: "Why's that bird dying?" When she saw a squirrel and some other birds in our yard, she asked if they were going to wake up the dead bird. It was fascinating to watch her process the situation. As much as I wanted to sheild her entirely, I realized it was because of my own discomfort in dealing with the topic. Duncan told me he was glad that she's seen the dead bird and had death explained to her, even in such a simplistic way. We agreed that it was better to have a such an experience with death before the inevitable happens to a person she knows. I'm finding it hard to choose what I should write about these days. There are so many things that I would like to share, but my time is limited and I'm sure my reader(s) aren't necessarily interested in every topic I think up. For example, I could write about the ant problem in our kitchen and how Duncan and I both (individually) thought that our former exterminator (that we hired to get rid of the one mouse we had over a year ago that died right after we hired them and not because of their efforts but because of a snap trap that we hadn't yet removed, but we'd already signed a contract for year and we canceled the service after that year) was bringing in truckloads of ants and dumping them on our back patio with the mission to enter our kitchen however they saw fit. I could also write about the unsuccessful potty training "event" we had on Saturday and how Amelie has asked twice to sit on the potty this morning, but hasn't "produced" anything. Or I could write about how we all have colds and Violet goes for her six month check-up later today and I'm not sure they'll let her have her shots. However, I think I'll write about our pastor's sermon last night and what I got out of it. It was about a lot of things, as all of his sermons are, but the main thing I learned was that it is sinful to live for free time. It is wrong and, not what God intended, for us to tend to our vocations with the simple goal of getting through the day,week, or career with the focus being on our evening off, weekend, or retirement. The focus should rather be on our calling, while we are in the midst of each thing. For me, this would be as I do dishes or laundry, as I read books or do puzzles with Amelie, as I change diapers or nurse Violet. We are to do each of them "as unto the Lord." This is not a new concept for me, as this was one of the primary focuses of the CCO ministries of which I was a part. It was an excellent admonishment and encouragement to me to be faithful in my calling as a wife and mother and homemaker. Our pastor clarified, as I will, that free time isn't a bad thing and it too should be used to glorify God, but it just shouldn't be the reason we go through the motions of the rest of life. I am so thankful for this reminder. I came to me at the perfect time, which, based on the little I know of God, isn't surprising in the least. Yesterday, the girls and I went out to Easton again. While there, we got to see my eldest niece, Erin. Erin Jane was born six days before my 12th birthday. I was an aunt in the sixth grade and I thought that I was so cool. 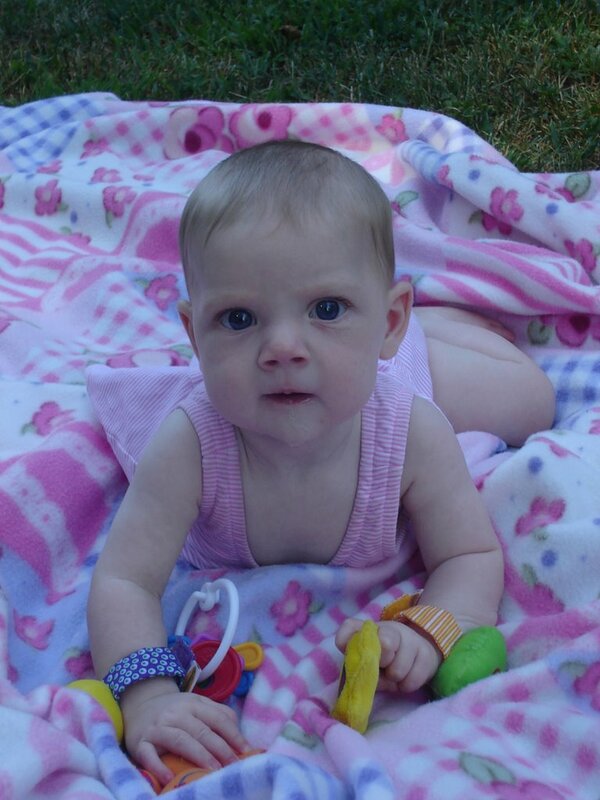 Her mom, my eldest sister, Karen, is 12 years older than me and I am 12 years older than Erin. I always thought that was super cool too. 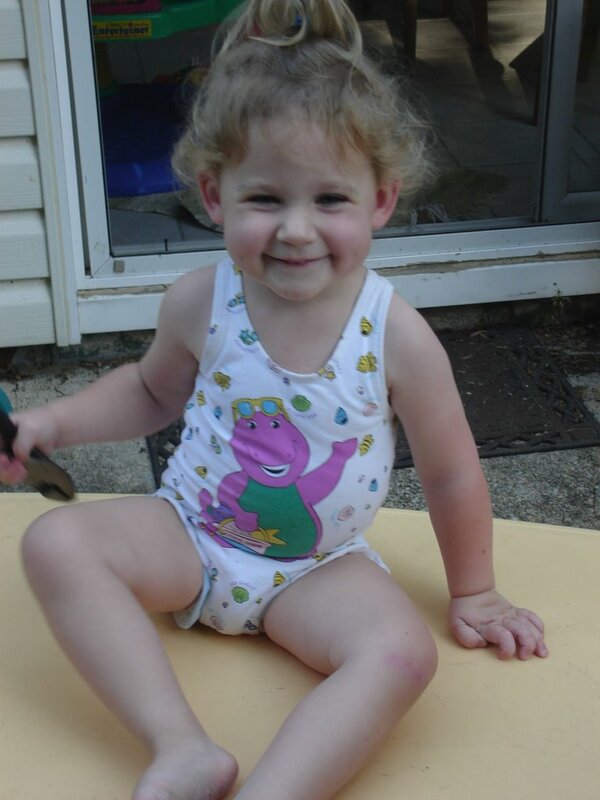 It has been such fun to watch Erin grow up. 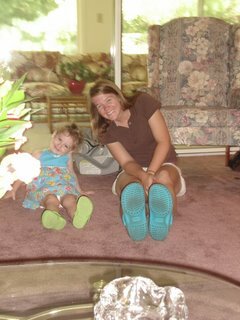 She was more the little sister I never had rather than my neice. She has emerged into such a beautiful, intelligent, giving young lady. She's heading off to her first year of college next week (Go Seahawks!!). I know she'll do well in school and have a (responsible) blast. Good thing she won't be too far away. I'll need my Erin Jane fix now and then, to keep me smiling. Amelie and Erin posing with their crocs on. 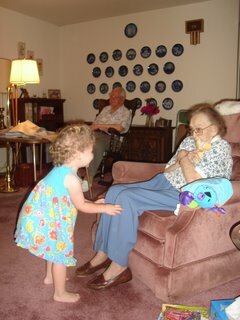 The purpose of our visit was to visit with my grandparents again. Amelie and Great Grandma were playing and singing London Bridge in these photos. As I expected, Amelie's warm up time was much shorter at this visit. We'll be going out to see them much more, I suspect. Today was the perfect day for the pool. We went early enough that we'd get plenty of playing in before it was time to go home and meet Daddy. When we got there the parking lot was suspiciously empty. I chalked it up to the imminent start of school around here. As I started to unpack the luggage that we take to all of our pool visits, a kind and merciful woman, in an attempt to save me from the unnecessary work of unloading everyone and everything from the car, informed me that the power was out so the pool was closed. Upon learning this, Amelie was devastated (Imagine tears, pitiful exclamations of "Why? Why, Mommy?" more tears and you'll get the picture.). 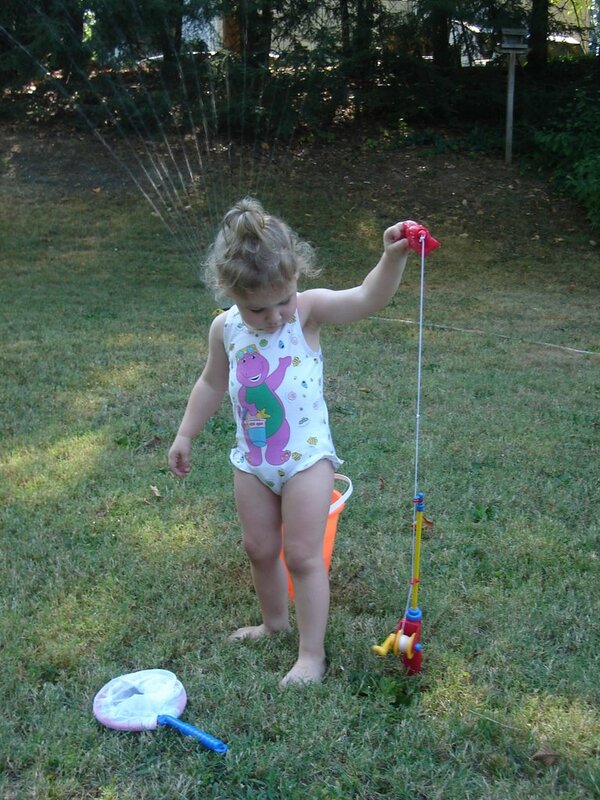 On the drive home while explaining numerous times that the pool was broken, so we couldn't go swimming, I thought of Amelie's recent facination with sprinklers and that we have one! 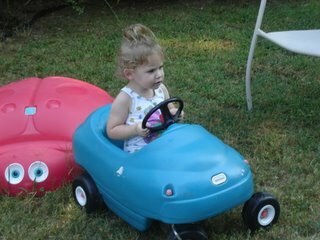 So when we arrived home, we quickly set it up in the backyard and spent the afternoon getting wet and digging in the sand box. Below are some pictures of the adventure. 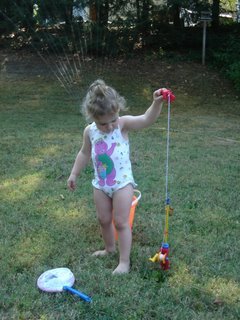 Violet's "sprinkler time" was much drier than her pool time. You've seen Girl With Watering Can? This is Girl With Pliers. When You Go to the Library, Be Sure to Wear a Helmet. Yesterday was library day. Our books were due, so we went to return them and pick out new ones. While I was emptying the backpack at the returns counter, Violet was behind me, in the stroller, and Amelie was standing behind her. Seemingly out of no where, a boy named Tommy ran, full speed, at Amelie and knocked her down. He was only slightly bigger than her, if at all. I found myself saying,"Oh, my goodness!" as I rushed to pick up my hysterical little girl. Tommy's mom ran over to attempt to wrangle him over for an apology. She successfully prompted him to say "I'm sorry for pushing you" while I was unsuccessful in getting Amelie to say "I forgive you." The mom also apologized to me and I honestly can't remember what I said in return. I hope I accepted. I was so shaken up, as was Amelie. I assured Amelie that she didn't do anything wrong, which was met by another round of hysterics. It was so weird. While the Mama Bear in me wanted to take care of Tommy, the Lord's quick prompting helped me to see it from his mom's perspective. I hope this was an isolated incident for Tommy, but somehow I doubt it. What must life be like with such an impulsive child? I'm sure it would be very difficult. Rather than seethe with anger when thinking about Tommy, I need to pray for him and his parents. It was also a reminder of my lack of control in the lives of my children. Amelie was in a "safe" place where "nothing" could happen to her, right? It was a reminder that there is no safe place and that it is only by God's grace that we ever safely get from here to there. I'm sure there are more lessons to learn from this situation, but I need to go and clean up the blueberry goop in the kitchen while Violet sleeps and Amelie watches Arthur. My first tag! How exciting! Keith tagged both Duncan and I for this one. Considering my current reading consists mostly of magazines, newspapers, and books by Sandra Boynton and the like, I'll do the best I can. 10. Now tag five people: Is it sad that I can only tag two? I tag Heather and Chrissie. I also tag Duncan, because Keith is right, he probably won't respond to either of us. And beside, he was Keith's sixth person. On July28, I put $30 on my Starbucks card. This is something I've done in the past, as well, in an effort to limit the amount of money I contribute to the coffee giant. As of today, August 14, I have $6.42 remaining on my card. That's got to last until August 28th...that was the idea, at least. *sigh* What's a caffeine addict to do? It did not, however, occur to me that I would have to TEACH her how to use them and that she would not have the coordination to perform the act of cutting. When I said this to Duncan, he asked:"Don't they like teach how to use scissors in kindergarten or something?" I guess they do. I taught middle school and all of my students used scissors just fine. Well...kind of, at least. Violet is working on it. 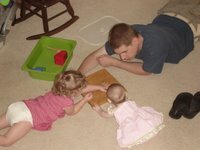 I love the picture of the three of them "working" on the puzzle--a little glimpse of things to come. Last night, in a thunder storm, we had a power outage and a power surge. The surge (yes we have a surge protector...they aren't invincible, obviously) fried our video card--whatever that is. All I know is that it means I can't use my desktop. I can't get to a list of e-mail addresses that I need to send out a mass e-mail about providing meals for a family in our church. I can't listen to music. (Well I could, but I'd have to get out those cds, blow off the dust, and put them into a cd player.) I feel so stifled! I'm glad that we have a laptop and that I'm able to get on the internet and check e-mail. However, it's like trying to cook a meal in someone else's kitchen when they're not there. I don't know where everything is. Everything takes much longer than it would if I were at home. And I just plain miss my own kitchen and the familiarity it brings. To top it off, Duncan has just gotten slammed at work today and informed me that he probably will be putting in some long hours this week. I CANNOT complain, since this rarely happens. It just means the new video card purchase and installation probably won't be happening anytime soon. Another fun thing that happened last night was that Duncan discovered about $100 worth of purchases on our credit card bill that we did not make. We had to cancel the card and transfer some automatic payments to another card. He spent a while on the phone trying to get that accomplished. Our plan was to go to bed early last night, but we didn't make it until nearly midnight. Through all of this, I am reminded of God's goodness to us. The lightening could have struck a tree that fell on our house. Our electricity could still be out so that we wouldn't have air conditioning or refridgeration. We could have had something much worse than a credit card number stolen from us. We could be in a situation where we don't have a bed to sleep in ever. The point is, it could ALWAYS be worse and God uses trials, even when they're small like ours, to teach us and to draw us nearer to him. Fortunately, these trial point me to Our Heavenly Father and cause me to glorify Him that is the giver of all good things! Praise Him! Yesterday, the girls and I took the trip with my mom that she takes at least weekly. We went to my grandparents' house, about an hour away from home. Both of my mom's parents are living. My grandma is 87 and my grandpa is 86. My grandma suffers from fairly severe dimentia, but is so sweet and still has quite a sense of humour. She was totally charmed by Amelie yesterday. Amelie is named after her, in fact. My grandmother's middle name is Muriel, which is also Amelie's middle name. My grandmother, however, has always gone by Muriel--not by her first name, which is Ethel. After the customary warm up period, Amelie had a ball. And Grandma did too. I was so convicted about not going out there more often. Even though my grandma probably won't remember the visit, while it was happening, she was so delighted. Even though Amelie won't remember the visit either, we'll have the pictures to look at and I'll be able to tell her about the time she spent with her namesake. When my mom is away in a couple of weeks, I'm going to go again. 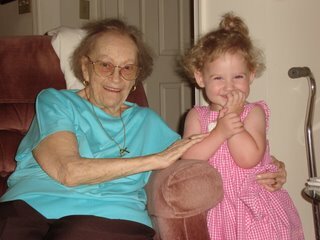 Amelie will remember the previous, recent visit and will hopefully pick up where she left off with her great grandma Muriel...scrunching her chunky toddler fingers into a spider that crawls up great grandma's arm and reaches her neck in the form of a tickle; all the while singing "Itsy Bitsy Spider..."